Isn’t It Time Our Genre Reflected Our World? Editor’s Note: Here at The Debutante Ball, we strive to give an insider look at our experiences with the publishing industry. But we also like to contribute to the dialogue on important topics in publishing, which is why this week we’ve decided to focus on diversity— and have each asked a guest author to discuss their experiences in the industry. We know we can’t solve the issues with a few blog posts, but we’re hoping we can add to the conversation and perhaps even spark some new ideas. I just finished Sonali Dev’s debut, A BOLLYWOOD AFFAIR. It was everything I love about romance — the slow burn, the swoony hero, the strong heroine — but so much more. It should come as no surprise that I fell madly in love with her mouthwatering descriptions of Indian food (the main character, Mili, and I would have much to discuss), but I also loved the colorful Indian wedding, the dark family histories, and ultimately the resolution (spoiler-free zone here). 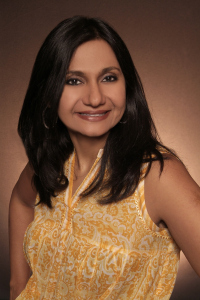 Sonali’s debut novel, A BOLLYWOOD AFFAIR, was on Library Journal’s and NPR’s list of Best Books of 2014, it won the American Library Association’s award for best romance, and is a RITA® finalist, RT Reviewer Choice Award Nominee, and winner of the RT Seal of Excellence. It was recommended by USA Today as a ‘must-read romance’ and hailed by NPR.org as a ‘stunning debut’. At the end of this post, we’ll be giving away a signed copy of her debut A BOLLYWOOD AFFAIR to one lucky commenter. Please join me in welcoming Sonali Dev to The Ball. Like so many of you, I inhaled books as a child. And I don’t mean that just in terms of volume but in terms of depth. I didn’t just read the books, I crawled inside them. I burrowed inside the characters like an insidious, hungry thing and flailed out my limbs to don their very essence like one pushes into a greatcoat with a broken zipper and breaks through the arm and neck holes in full ownership. I ate these stories up from the inside out. My little whitewashed room in our hundred-year old Mumbai apartment took turns transforming into everything from the halls of Pemberly to the turreted common rooms of Enid Blyton’s Mallory Towers. I loved Oliver Barrett and Father Ralph de Bricassart long before my love found a flesh and blood boy to inhabit. In other words, before I was in college, I, a bonafide brown-skinned Indian girl growing up in urban India thinking in English, had been a lot of white people. And then one day I picked up M.M. Kaye’s Far Pavilions. Until then the people I became in books had names like Jane and Maggie. To find a heroine who was called Anjulie, even though she thought of herself mostly as ‘Julie’ was an event so significant, it might have altered the course of my life. Julie was Indian and she was in a book and somewhere in my head, an impossible thing became possible. Then came Vikram Seth and his Suitable Boy about a regular Indian girl with an overbearing, close-knit family, and she fell for a brown-eyed boy while browsing poetry in a Delhi bookstore (sigh), and the way I had fit into characters before that shifted and became not about traveling to lands far far away but about exploring where I came from and what that made me. The stories that I had spun for as long as I could remember became things that might find their way onto bookshelves. Somehow in finding myself in a book, I found the knowledge that what I had to say might interest someone other than me. It made me matter. But that’s not the best part. Yes, discovering characters with my skin color empowered me to pick up the pen, but the equally significant fact is that reading books from cultures different from mine let me crawl into bodies and minds that should have seemed foreign but never did. That’s the thing about books, they are the only painless method of stripping away our skin and unifying us at a level where all we are is human. I just returned from the Romance Writers of America’s National Conference where I was a RITA finalist. The RITAs are universally acknowledged as the Oscars of the Romance genre and it was a great honor to make the final cut. But the best part about being a finalist was being able to contribute toward raising visibility for diverse books. A total of four ‘other’ books were finalists in the RITAs this year and none won. And while seeing diverse books final in an overwhelmingly white genre is progress, the fact that none won is a little disconcerting with respect to the speed of the progress. In the end, winning in any category is a matter of odds. Each person who was a finalist in my category, which had nine finalists, had a one in nine chance of winning. But for the diverse books, on top of the one to nine odds I feel like there was an extra multiplier for otherness. Because the material simply feels foreign to so many readers, and there’s always a chance that you get some of those readers judging your book. Unfortunately the only way to reduce that multiplier is to make diverse books more prevalent. And no one is going to give us more diverse books unless we buy the diverse books already out there. It’s called supply and demand. The reason there is so little diversity in books is that it is so easy and enjoyable to read within the comfort zone created by the un-diverse books so plentifully available to us. And until we read outside our comfort zone, we will never grow the confines of that comfort zone, and the powers that be will have no market to feed. So go out and buy a few diverse books, maybe you’ll travel to fantastic and heartbreaking places. Maybe you’ll find that hearts break in much the same way no matter who you are. And just to know that, to feel that, it might be worth it. Plus, it might urge a voice that might’ve forever remained silent to speak up and touch you in ways you never imagined, and this genre we love so much might finally represent the richly diverse world we live in. GIVEAWAY: Comment on this post by Noon (EST) on Monday, August 3 to win a copy of A BOLLYWOOD AFFAIR. Follow The Debutante Ball on Facebook and Twitter for extra entries—just mention that you did so in your comments. We’ll choose and contact the winner on Monday. Good luck! Follow Sonali on Twitter, Facebook, and her Sonali Dev website. Oh, this one has been on my TBR list! Can’t wait to read. Thanks for joining the Ball today, Sonali — so great to have you, and your wise words, here. Thanks for having me. And Amy did such a great introduction. Great post! So important and moving! I agree we need more diversity, and this, this, this, “That’s the thing about books, they are the only painless method of stripping away our skin and unifying us at a level where all we are is human.” Yes! I was thrilled when Anna Richards, His Road Home won the RITA. The novella has two “other” main characters, including a Mexican American service man who is wounded in war and is missing his legs. Such a great read. 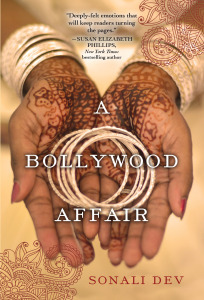 I am currently reading A Bollywood Affair and LOVE it! I had no idea about Anna Richards’ book. Must buy and read. Thanks for pointing that out. When I was growing up in Southern California, my friends came from all over the world and in all colors. My romance heroes and heroines didn’t. I haunted libraries and bookshops looking for a romance with a character that didn’t look like me (white, brown hair, brown eyes). Thoroughly a member of the crowd). I too fell in love with M.M. Kaye. 40 years later, I still have The Far Pavilions on my favorite bookshelf. I’m so glad I can read books by women from different cultures. I just put this book on my TBR list. Thanks so much for the post. Excellent post, Sonali. I loved Bollywood Affair and I’ve preordered Bollywood Bride. I do think the romance genre is ready for more diversity (in many areas), and I’ve enjoyed what I’ve found so far. Me too, Kay. There are such wonderful and talented authors writing diverse romance, it’s just a matter of more people giving them a try. Thank you so much for this post. I loved The Bollywood Affair and I was rooting for you to win a RITA on Saturday night. I was absolutely convinced that you would win, given the quality of the book and the reviewer accolades that the book has received. It wasn’t until I got home from RWA and read your tweets stating that you knew you wouldn’t win because of the odds were multiplied steeply against ‘other’ books that I realized that my conviction that you would win and my lack of awareness of those multiplied odds against your book was my white privilege speaking. I had the privilege of [ignorantly] believing that the playing field was level. But of course it’s not level, and I thank you for having the courage to speak up about this hard truth to make me and the RWA community aware. I have to believe that this new awareness brings us one small step closer to change. Thank you. Thanks, Melissa! And I hope that my words about the playing field not being level don’t sound like I mean to in any way minimize the wonderful authors who did win. In fact, Clara Kensie who did win is a very dear friend and a critique partner. So, I am thrilled to bits that she won (and I got to touch her trophy). But you are right, the playing field is not level and we have to actively work toward leveling it. Well said Sonali! So much wonderful happens when you can open yourself up to new worlds just by turning a page. I too, loved The Far Pavilions, A Fine Balance, The Power of One, ALL of the Jane Austen novels and many other books that were outside my own life experience. Thanks for reminding us that different is just that–different, and not always something to be feared or put aside. I was disappointed that none of the diverse books won a RITA this year and I’m going to be hopeful that soon, that statistic will change. I feel the same way, Pamela! Hopeful. Because we are moving forward. I already have Sonali’s book (which I love!) so please don’t include me in the drawing. I just wanted to stop by & read the post. So glad I did. Thanks Debutante Ball for the spotlight on diversity and thanks Sonali for sharing your insight. As an educator, I deal with this frustration, too. It’s been very difficult in the past to find books that reflect the changing faces of our nation’s classrooms. Slowly, but surely this is improving in everybody (picture) books as well as novels for young people. And I’m hopeful that as authors increasingly write books at the elementary level with characters who have brown and black skin, this trend will move with our students as they advance into middle school, high school, and adulthood. It really is a matter of supply and demand. Thanks for all your support, Patty! You know what would be wonderful? If children’s books with diverse characters stopped feeling so ‘one off’ or token. The dream is that we come to a point where multiculturals aren’t even shelved as such. Multicultural isn’t exactly a genre, more a character description at best. It’s this, right here: “reading books from cultures different from mine let me crawl into bodies and minds that should have seemed foreign but never did. That’s the thing about books, they are the only painless method of stripping away our skin and unifying us at a level where all we are is human.” Absolutely, beautifully true! Thank you!!! Thanks, JB, It’s an utter tragedy to limit our reading choices this way. It negates the very reason we read, right? Fantastic post by one of the finest storytellers whose work I’ve had the pleasure and privilege of reading. You are too kind and generous as always.